All weapon types (1HN, 2HN, DW) have the ability to perform all the Killmoves in the game, 43 in all with 1.5 patch. 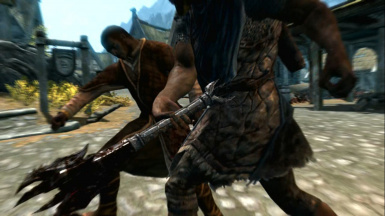 Also all weapon types can perform backstab, sneak attacks and now killmoves can be performed using the left hand. >Fixed problem with last enemy limit removed and player immunity not working properly. >Dual decap move is now optional. >There are now 3 different killcams to choose from if you pick either of the two No 3rd Person Killcams: Above and Behind, Left Side and Right Side cams. (read Versions section for more details). >Update 3 - fully balanced 18 normal killmoves and extra killcams. Fixed the imbalance where some moves were intentially made to be more frequent than the others, now all killmoves are equally as likely to be executed. The extra killcams are some of the dragon killcams made so that they can be seen during killmoves on humans and creatures. >Update 2 - fixed bug where camera does not follow player and player goes out of the screen during killmove. File details - No 3rd Person killcam including no blur effects (see Versions - Optional for more details). >This mod adds to all weapon types (1HN, 2HN, DW) nearly all the Killmoves in the game, plus with the new 1.5 patch 43 different Killmoves can now be used. >Killmoves can be performed with both normal and power attacks, plus now with update 4 the left hand can also be used to perform killmoves (due to most of the killmove animations being done using the right hand there were not many killmoves to choose from for the left hand). >18 Normal Killmoves, 3 Decap Killmoves, 2 Bleedout Decap Killmoves and 1 Bleedout Killmove. Furthermore, the Backstab and Sneak Attack moves are now available for all weapons. *Normal Killmoves means killmoves that don't require strict conditions like perks or being in sneak. >Patch 1.5 Killmoves: 14 Normal Killmoves added (2 are unarmed and 2 are for warhammers/battleaxes only and weren't added to the other weapons), 2 Sneak Attacks and 3 Backstab Attacks. 1HN Sword/Dagger - Total: 39 Killmoves - 27 Normal Killmoves, 3 Decaps, 2 Decap Bleedouts, 1 Bleedout, 3 Backstabs, 3 Sneak Attacks. Added 2HN stab, 2 Killmoves from 1HN mace/axe, made all 1HN rare killmoves more frequent, 2 Decaps from DW and 2HN, 2HN Bleedout Decap. 1HN Mace/Waraxe - Total: 39 Killmoves - 27 Normal Killmoves, 3 Decaps, 2 Decap Bleedouts, 1 Bleedout, 3 Backstabs, 3 Sneak Attacks. Added all 1HN killmoves and 2HN stab, 2 Decaps from DW and 2HN, 2HN and 1HN sword Bleedout Decaps, 1HN sword Bleedout Killing Blow, Backstab, 1HN Sneak Attack and 1HN Sneak Decap. 2HN Greatsword - Total: 39 Killmoves - 27 Normal Killmoves, 3 Decaps, 2 Decap Bleedouts, 1 Bleedout, 3 Backstabs, 3 Sneak Attacks. Added all 1HN killmoves, 2 Decaps from DW and 1HN, 2HN and 1HN sword Bleedout Decaps, 1HN sword Bleedout Killing Blow, Backstab, 1HN Sneak Attack and 1HN Sneak Decap. 2HN Battleaxe/Warhammer - Total: 45 Killmoves - 30 Normal Killmoves, 4 Decaps, 3 Decap Bleedouts, 1 Bleedout, 4 Backstabs, 3 Sneak Attacks. DW - Total: 39 Killmoves - 27 Normal Killmoves, 3 Decaps, 2 Decap Bleedouts, 1 Bleedout, 3 Backstabs, 3 Sneak Attacks. Added all 1HN killmoves, 2 Decaps from 2HN and 1HN, 1HN and 2HN Bleedout Decaps, 1HN sword Bleedout Killing Blow, Backstab, 1HN Sneak Attack and 1HN Sneak Decap. There is an extra Sneak move that decapitates the enemy (it is essentially the 1HN Decap but performed while sneaking and from behind). For those who want to get a killmove even with enemies in close vicinity there are options available (see Versions). 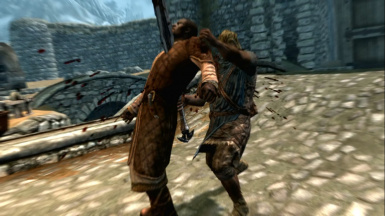 Performing decapitation moves still requires either the perks 'Savage Strike' or 'Devastating Blow'. With the extra added decapitation moves to each weapon type you do not need to have both perks. For example, performing a 2HN decap with a 1HN sword will require 'Savage Strike' and not 'Devastating Blow' because a 1HN weapon is used. This applies also for the 2HN weapons requiring the 'Devastating Blow' perk for performing all the 3 Decap moves that have been added. The only killmoves not used are the ones for warhammer as it seems that other weapon types are unable to use these killmoves, not sure why even the patch 1.5 killmoves. I have made a compilation video for all the new animations added to all the weapon types in the game. Well originally it started out as a compilation then I playing around with the video to make it more like a movie, then things got a bit weird and eventually it came out like this. Of the 18 Normal Killmoves, 6 are from 1HN sword, 9 are also from 1HN sword but were rarely seen, 2 are from 1HN axe/mace and a 2HN stab from 2HN greatsword/battleaxe. Some of the moves are problematic, for example, dodgy cameras, prematurely and annoyingly stopping and then you have to watch your character stand like an idiot whilst your mashing the keyboard and screaming at the screen TO MOVE!! This is the reason why I made 1HMKillMoveJ (see below) more rare than the others. I might remove it entirely actually I better do that. The mod now with update 5 has a menu system for installation. Below I have detailed varies bits of the mod including the optionals. >The main aspect of the mod is all the killmoves added, see section 'Added Killmoves for each weapon' for more information, which are installed regardless of the options chosen. At the moment no killmoves can be added or removed. >All killmoves are added to the normal and power attacks of the right hand and some have been added so that they can be triggered by the left hand. Last enemy limit removed - with this you can perform killmoves even with multiple enemies in the vicinity. Player cannot be killmoved - with this player cannot be killmoved by other enemies. 1st Person only - 1st person only killcam - Kill moves are always performed in 1st Person when in 1st Person view. Killmoves performed in 3rd person will, however, always be performed in 3rd person. 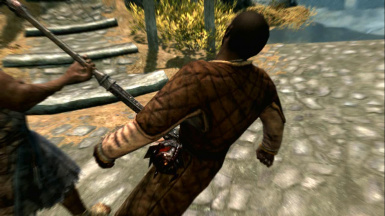 No 3rd Person killcam (including no blur effects) - When killmove is performed it is viewed above and behind the player. This is for 3rd person only i.e. killmoves in 1st person are performed in 1st person. No 3rd person killcam - 3rd Person only (including no blur effects) - No 3rd Person killcam including no blur effects. When killmove is performed it is viewed above and behind the player. 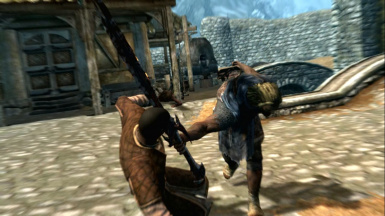 In this version killmoves are performed in 3rd person regardless of whether you are in 1st person or already in 3rd person. Slow motion normal version - This file adds a slow motion effect in the 1st Person killcam that is often seen in 3rd Person killcams. Slow motion effect occurs when you first hit the enemy with your weapon and lasts for few seconds before going back to normal time. In this version slow motion effect is half of normal time. Slow motion slower version - This file adds a slow motion effect in the 1st Person killcam that is often seen in 3rd Person killcams. Slow motion effect occurs when you first hit the enemy with your weapon and lasts for few seconds before going back to normal time. Slower version is 0.3 of normal time. I also have a unarmed kill mod, Extra Unarmed Kill Animations, that adds the 1HN and 2HN killmoves to unarmed. Wabbajack Unleashed - More effects. 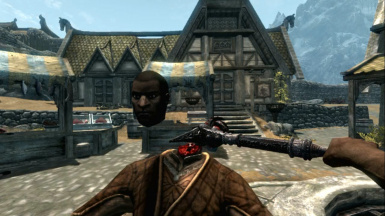 This mod gives the wabbajack more crazy effects check it out and the videos. Using Nexus Mod Manager - a new menu system has been added in update 5 of this mod which enables a much easier way to install this mod along with certain optionals. See 'Mod Details' section for more information on the options. If you have any problems with this mod or my soul then please feel free to leave comments and also endorse this mod.